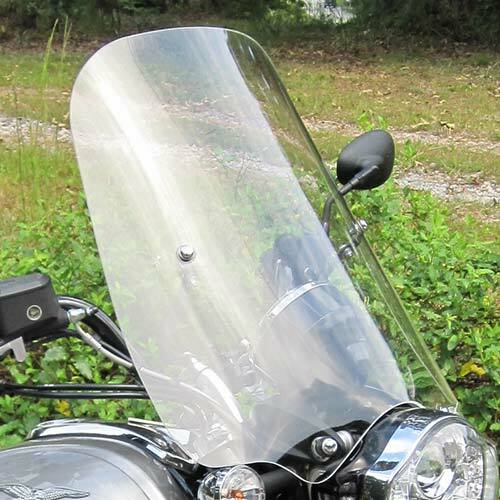 The Parabellum Touring windshield for the Motto Guzzi California has a special Euro touring shape, angle and bow that will give you quiet protection and less air drag. It accommodates the new configuration headlight while maintaining a classic look and makes your riding experience more comfortable and pleasurable whether you are running errands or touring across the country. The windshield is light weight, bolt-on and comes with stainless steel hardware. The windshield is 3/16 inches thick and made of military aircraft grade cast acrylic for excellent clarity. The Parabellum Touring Shield is 22 inches wide and offered in three heights and in clear or tint.